*to read this article on the Urban Milwaukee website please click HERE. Bill (Bee) Reid is a bit of a joker. He likes to make up words — internet “info” becomes “infaux” — and admits that people find him “goofy.” His work will bring a smile to your face. His metal sculptures, often shaped with the help of a torch, are fantastical creatures, which may manifest themselves as vehicles, instruments, or as endearing “beasts” as he refers to them. 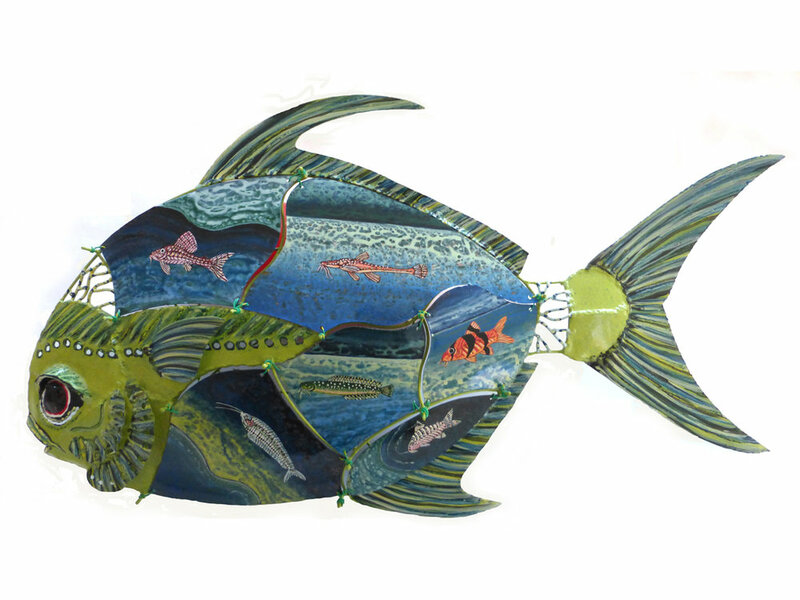 Whatever form they take, his imaginative animals are full of wonder and whimsy and reflect a childlike approach to envisioning the animal kingdom and all that inhabit it (or don’t). He’s created his own personal folklore. His work has been featured in programs on PBS and the BBC and galleries and museums from California to New York City. Reid has earned a prominent niche in the national sculpture community as well as being a fixture locally in Racine where his family moved when he was a young teen, and where he still lives and works. He switched from a liberal arts college to Kansas City Art Institute, where he got his bachelors degree and then got a masters degree from Cranbrook Academy of Art. His brightly-painted sculptures will be featured alongside the work of painter Derrick Buisch at Tory Folliard Gallery through December 31st. Urban Milwaukee had a chance to ask the busy “Bee” Reid some questions about his past, his art, his opinions about the art world, and what this new show means to him. Q: How old are you, and where did you grow up? A: I am 62, just got my Lifetime Senior National Park Pass. Born in Buffalo, NY. Never exactly grew up but lived in a little town in Ohio until the summer of ‘68 when we moved to Racine. Q: How did you first get interested in art and in sculpting metal? A: At the Prairie School here in Racine in 8th grade. We did aluminum casting there. A: When I made the commitment to go to art school after two years at a liberal arts school. Q: Any mentors that helped your growth as an artist? Q: How has your art changed as your career has developed? A: I can make things better than I could craft-wise now than 20 years ago. I think I have developed more of my own vocabulary of my personal world, still wondering and trying to break a code of imaginary solutions. Q: Where does this show at the Tory Folliard Gallery fit into your history? A: Tory has been around for a long time and represents many of the best artists in Wisconsin and I am honored to be a part of the experience in my own goofy way. Q: What’s it been like working with the gallery? A: I have always loved the people who work there, as a matter of fact I met my wife Nicole there. She worked there for about 10 years. Q: What do you hope viewers get out of this show? A: People think I am goofy and out there but since we are living in a time of badly-written science fiction it seems I am more accepted now. It would be great if animals in general got some more respect. I try to put nice shoes on them to help them out. Q: Can you discuss your creative process, is there a lot of preliminary work before you start welding? A: I have made so many things that it’s fairly comfortable getting a start. Often it starts with a quick sketch and a play on words. Sometimes the idea is clear from the start, sometimes not, but things usually work out. Q: You’ve been called the “Dr. Seuss of Sculpting”; where do you draw inspiration for your fanciful constructions? Q: Do you have any self-imposed rules when creating work? A: It talks to me and if things are not lining up I listen and try to make amends. Q: You have said you were “drawn to the sirens’ call of fire”; how would you characterize your relationship to fire? Q: So what’s the most indispensable item in your studio? Q: Is your work thematically driven or is each new piece or series exploring something different? Q: What do you like or dislike about the current art scene? Q: What do you think is the biggest misunderstanding visual artists have to deal with? A: Sculpture seems a foreign language to the general public as there is now a generation of people who for the most part have no idea how to make things; they just know how to click and look down at the screen while the birds are flying above them. A: It seems to spread more infaux. Also, sculpture has a presence and is a physical thing that of course does not come through on a little screen. Q: Any future shows or projects you’d like people to know about? A: I’ll be on Around the Corner show this March on PBS.